When the world thinks of leadership it usually has certain ideas in mind. Attached to these ideas are words powerful with imagery and meaning. In fact, when we think of Jesus and how he led, we need to think in completely different terms. Rather than being invested in office, power, status, prestige, appearance, or performance, Jesus was invested in words like ransom, service, and love. In Mark 10:45, these words of our Lord Jesus were recorded: “For even the Son of Man did not come to be served, but to serve, and to give his life as a ransom for many.” Now think about that for a few moments…and ask yourself a question, “How would Jesus lead people out of darkness, away from Satan, sin, and self, and into the eternal arms of his Father?” He would do so by giving himself as a ransom — a payment for our sin, an eternal credit to cover our egregious debits. He would do so by not asking for what was rightfully his to possess — our servitude — but instead by serving. In Philippians 2:5-8, this great truth was recorded by the Apostle Paul: “Your attitude should be the same as that of Christ Jesus: Who, being in very nature God, did not consider equality with God something to be grasped, but made himself nothing, taking the very nature of a servant, being made in human likeness. And being found in appearance as a man, he humbled himself and became obedient to death—even death on a cross.” Now notice Paul did not say Jesus gave up his deity. Instead, he wrote about what Jesus took upon himself: humanity, servant-hood, humility, and obedience to sacrifice. While he did not relinquish his deity, he did give up his turf. It was not important that he be able to hold tight to his heavenly glory. As a result, just as we saw in the Gospel of Mark, he came to lead us into salvation through service. In John 15:9-17, we read: “As the Father has loved me, so have I loved you. Now remain in my love. If you obey my commands, you will remain in my love, just as I have obeyed my Father’s commands and remain in his love. I have told you this so that my joy may be in you and that your joy may be complete. My command is this: Love each other as I have loved you. Greater love has no one than this, that he lay down his life for his friends. You are my friends if you do what I command. I no longer call you servants, because a servant does not know his master’s business. Instead, I have called you friends, for everything that I learned from my Father I have made known to you. You did not choose me, but I chose you and appointed you to go and bear fruit—fruit that will last. Then the Father will give you whatever you ask in my name. This is my command: Love each other.” Love is crucial to our understanding of our Savior’s leadership style. It does not mean, necessarily, that we give into the cries or demands of others. It does not mean that we enable the sin of others by glossing over them and refer to ourselves as having loved unconditionally. Instead, it means that the one loving must always do what is best for the one being loved. which led to his ministry of service. 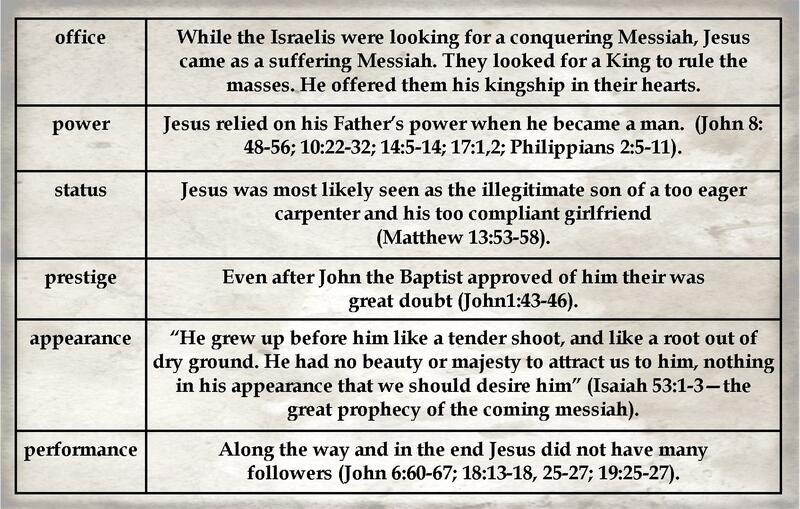 We can see this in Jesus by referencing some modern day leadership concepts and comparing them to his life. For example, consider the four leadership styles usually referred to as Dominant, Influential, Steadfast, and Conscientious — sometimes referred to as the Lion, the Otter, the Golden Retriever, and the Beaver, or as the Driver, the Promoter, the Supporter, and the Analyzer. Jesus, however, shatters the boundaries between each style. In fact, while each of us will show differences on each scale, Jesus will flat-line high (score the same and score high) on all of them. Why? The answer is not so difficult: since Jesus is motivated by love, he mobilizes himself as a ransom, creating on our behalf a ministry of service. This requires that he be the complete person and, of course, he is. ● At times Jesus leads as a Driver. “Jesus entered the temple area and drove out all who were buying and selling there. He overturned the tables of the money changers and the benches of those selling doves. ‘It is written,’ he said to them, ”my house will be called a house of prayer,” but you are making it a “den of robbers.” The blind and the lame came to him at the temple, and he healed them. But when the chief priests and the teachers of the law saw the wonderful things he did and the children shouting in the temple area, ‘Hosanna to the Son of David,’ they were indignant. ‘Do you hear what these children are saying?’ they asked him. He utterly, completely, dominantly takes charge. ● At other times Jesus leads as a Promoter. Like a true team builder he says to his closest disciples, “I no longer call you servants, because a servant does not know his master’s business. Instead, I have called you friends, for everything that I learned from my Father I have made known to you” (John 15:15). He expressively, socially, influentially builds trust. ● At yet other times Jesus leads as a Supporter. Like a tender-hearted, empathetic care giver he touches the leper and says, “I am willing, be clean” (Mark 1:40-42). He compassionately, amicably, steadfastly seeks to serve. ● Still, at other times Jesus leads as an Analyzer. Like an organized, detailed teacher and manager he assigns ministry to his disciples, sending them out two by two, and says, “Take nothing for the journey except a staff—no bread, no bag, no money in your belts. Wear sandals but not an extra tunic. Whenever you enter a house, stay there until you leave that town. And if any place will not welcome you or listen to you, shake the dust off your feet when you leave, as a testimony against them” (Mark 6:8-11). He compliantly, conscientiously, objectively, administratively outlines the tasks. So, what do we learn from all of this? …becoming a ransom…being willing to sacrifice on behalf of others. …becoming a servant…being willing to do unto others even what others are not willing to do for us. …becoming a vehicle for love…being willing to do whatever is best for others. 3. We also must learn that, like Jesus, being accomplished in many areas is a spiritual work. Jesus flat-lines high on all leadership traits because of his nature and his willingness. What dangers do we risk as we start to flat-line? One danger is of our own making. If we flat-line in the flesh, rather than through the filling of the Holy Spirit, the Lordship of Christ, and the sovereignty of the Father, we are not becoming Christ-like leaders, but chameleon leaders. Another danger comes from others. Even if we flat-line through the Spirit, others may perceive us as chameleon-like. They may attribute our situational abilities as hypocrisy. They may accuse us of being two-faced and manipulative. They may argue that we are attempting to be one thing to one person and another thing to another person just to win some kind of personal advantage. What do we do then? Like Jesus, we recognize the judgmental inclinations in people and press ahead with humble and contrite hearts. 4. We must likewise learn to think outside our own grid. Others are not like us. They do not always share the same personality. They do not have the same likes or dislikes. Their backgrounds are completely different from ours. Like us, they are unique. As we lead people, we need to understand how God has designed each person. As we learn to think through their grid, we become far more capable of sacrificing on their behalf through loving acts of servanthood.